We have started to accept the applications of 2018 UPBEAT Halloween Party!! Please call us for a reservation. Better to hurry up! Due to Japanese Bon vacation, all the campuses will be closed from August 11th(Sat.) to August 17 (Fri.). We have stopped accepting 2018 Over Night Camp applications since all of our vacancies are full now. 大人気、「2018 UPBEAT Summer Time Program」の申込み開始!! 『2018 UPBEAT Summer Time Program! !』is open now! First come and first served! Great opportunity to get to know UPBEAT School. Space is limited, so let’s get started now! Sure, "Summer Day Course" plan is coming up soon! We are opening a Summer Special Course in Tempaku Campus. 3 days of full English program only for students with English base. Study report will be handed out at the last day!! Please find the detail on Events page. We have stopped accepting the Spring course applications. We are looking forward to seeing you on that day! We have stopped accepting the Over Night Camp applications since all of our vacancies are full now. if you would like to attend the event, please apply as soon as possible. We have started to accept the applications of 2017-2018 Spring Course,Over Night Camp, and 2 Days Special. Thank you for all of your support last year. We will keep on driving forward with staff, teachers and everyone for further English education development! New Tempaku school has already set up a scaffold. Finally full-fledged construction has began! and looking forward to seeing you on next trimester!! 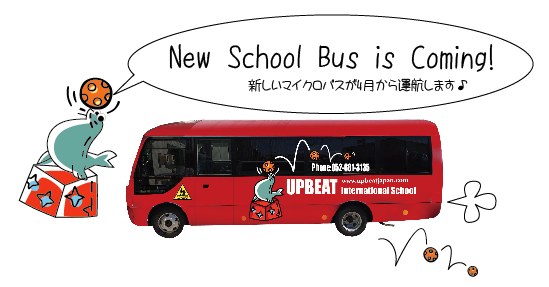 UPBEAT will be closed from Dec. 29th to Jan. 5th due to Japanese New Year Holidays. Feel free to contact us by e-mail during holidays. Tomorrow is exchange day off, UPBEAT will be closed. All Monday after class also will be closed. We have stopped to accept application of Winter Course and Christmas Event. We have started to accept the applications of Winter Course and Christmas Event. We have stopped accepting the Halloween Party applications since all of our vacancies are full now. 16 (Wed.).Thank you for your understandings. Enjoy your holidays, and see you on 17th!